If you've been to the Ancient Arizona exhibit at the Desert Museum, you know how much fun it is to chip away at the fossil rocks to find casts of trilobites and other ancient animals. Of course, those aren't the actual fossils - if they were, our scientists would probably be studying them! Instead, we take real fossils and make molds of them. 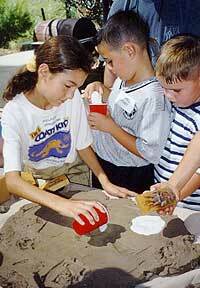 Then we're able to make cast fossils that look real, and kids can take them home. At a Coati Club Event, Michael Lee, ASDM exhibits designer, taught a whole crew of Coati Kids how to make the fossils in our exhibits -- that is bone castings and molds. The kids made everything from mountain lion paw tracks to jaw bones. It was a messy day, but was it ever fun! First they had to understand the difference between casts and mold. 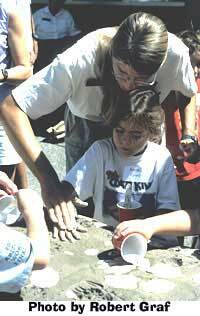 Casts are used to make an imprint in the rock or clay as we were using. This makes an impression which is then filled in with plaster-of-paris, which dries into a nice hard fossil. A mold on the other hand is like a cup or indentation which is filled up with the plaster-of-paris to make the fossil. So you can get a fossil which is the outside of the inside or the inside of the outside of what your fossil is. Pretty confusing but it all made sense when Michael Lee explained it. 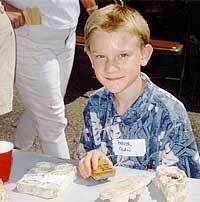 Then Michael showed the fossil-makers just how to make their plaster-of-paris. It takes a cup of water and then you have to mix the powder just so to get the right consistency. Once done, it is time to pour your plaster. Then wait, wait, wait. You can't remove your fossil until it is baked. Baked? Well, it doesn't need an oven because the plaster-of-paris gets very warm while setting. That is because the molecules are flying about creating heat as they set. When the plaster finally feels cooled down, you know your fossil is ready to be removed from the clay or from the mold. Viola, a brand new fossil. You can make a fossil of anything -- a jaw bone, a trilobite, coral, or even your hand. Everybody was working hard to make fossils. It was a messy job but so very rewarding. How many people do you know have their very own trilobite or their very own hand that they made into a fossil their very own selves? It was pretty cool!